While walking the floors of a trade show, you will almost certainly see a number of attendees toting promotional bags. This is for a good reason. They act as walking billboards so their mobile message stays top of mind and generates more brand impressions (5,700+) in the U.S. than any other type of promotional item. Businesses hand out bags with their printed logos during trade shows to generate leads, promote brand awareness and foster positive impressions. But, what types of trade show bags should marketers hand out to extend brand visibility beyond the exhibit hall? We’ve put together a list of bags that are designed to aid marketers in their journey towards generating trade show marketing ROI. Before making a decision, imagine yourself as one of the attendees that will be receiving dozens of brochures, pens, USB drives and many other gifts at the trade show, while also carrying personal items like notebooks and iPads. This presents a great opportunity to offer durable custom bags that the trade show attendees can put to good use while advertising your brand name in the process. If you want to think a little outside the box, wine totes are also great bags to consider. They’re designed with a wide range of sizes and colors so attendees can choose their preference and even the bottle capacity. Before making a decision, remember that recipients may use these bags for more than just carrying wine bottles (storing tools, cleaning supplies, etc.). Additionally, check your calendar to see if a holiday is approaching and consult a manufacturer like Factory Direct Promos to design more festive prints on the bags to impress even further. Custom cooler bags are the perfect on-the-go promotional gift because they’re also useful in many other situations, including picnics, camping, weddings, and while traveling or pursuing other outdoor activities. Another “cool” thing about custom cooler bags is that people can not only store their beverages inside, but they also can utilize the side pockets to carry extra water bottles, snacks or other on-the-go items. Of all the promotional bag options, drawstring bags are the most light-weight. If transporting a high quantity of heavier bags to the tradeshow is too much of a headache, opt for drawstring bags that can save you sufficient space. Drawstring bags are one of the most popular promotional items with trade show attendees because they are convenient to use not only during the show, but also for many years after the show. Creating an environmentally-friendly image for your company is important, as many people will think more favorably of brands with a sustainable, eco-friendly message. Many eco friendly messenger bags are made with eco-friendly content and can be used for many years. You can have the manufacturer design messenger totes tailored to your trade show attendees: one option is multi-function pockets to store pens, sunglasses, keys and phones. There are a number of different trade show bag options that can wow your audience and help you stand out from the competition. Custom bags, wine totes, cooler bags, drawstring bags, and messenger bags are just some of the choices that can increase your brand visibility and reputation. Regardless of which bag you choose, studies show that the majority of consumers pick up promotional products (like reusable bags) at trade shows and use them long after they leave the exhibit hall. 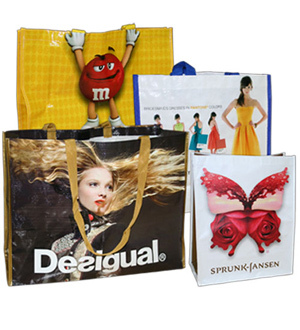 Promotional bags are an effective way to attract attention and maintain constant exposure over a long period of time. If you’re still trying to decide which bag is right for your next trade show, reach out to Factory Direct Promos today and bring your brand to the next level.